ALPINA is a true family affair, but, above all – and without any undue pathos -, one man’s automotive vision. That man’s name is Burkard Bovensiepen, and his vision wasn’t defined by a single criterion, but a number of, sometimes contradictory, objectives: reliability, exclusivity, inconspicuousness, precision, quality, performance and efficiency. Before trying to find out how such a small business (ALPINA is selling less than 2.000 cars per annum) could even hope to deliver on such a comprehensive premise, it is important to take a look at the man who not only lent the company its official name, but, more importantly, its soul. As befits as complex a creation as ALPINA, Burkard Bovensiepen is a rather complex man. A bonafide bon vivant, as well as a noted perfectionist (traits that typically exclude one another), Bovensiepen has acted as ALPINA’s general manager, a self-educated engineer, and put himself in charge of marketing and styling. There is simply no part of his company he hasn’t engaged in on a significant level, yet he’s far from a control freak who times his underlings as they’re off to the loo. History has proven Bovensiepen to be a patron of some outstanding talents, not least former ALPINA head of engineering, Fritz Indra, who went on to a remarkable career at Audi and GM, and Indra’s long-serving successor, Alois Wiesinger. A renowned food and wine connoisseur, Bovensiepen is also one of Germany’s premier wine merchants, which results in Alpina Feine Weine boasting a legendary cellar – both in terms of its size and the quality of its contents – right on the premises of ALPINA. As a man who understands about taste, Bovensiepen has lent ALPINA a clear identity that stretches far beyond capital letters and Deko-Sets. Of course, much choice is given to ALPINA’s customers, who can choose leather, suede and fabric in any possible colour combination to their respective hearts’ content. But the base, the root of the changes in comparison to each ALPINA’s donor BMW, is thoroughbred Bovensiepen. Which leads us back to the ALPINA premise of marrying reliability with exclusivity, inconspicuousness with precision, and quality with performance and efficiency. All these traits are, to some extent at least, dictated by the standards of the Bayerische Motorenwerke, but are either intensified or smoothened by ALPINA’s corps of engineers and craftsmen. BMWs are fast, BMW ALPINAs are faster. BMWs are reliable, BMW ALPINAs are just as reliable, or even more so (certainly in comparison to M GmbH’s products of yore, which actually did owe a lot to motorsports, for better and worse). Where the quality of BMW components is just sufficient, ALPINA exchanges them for parts of the utmost quality, as a BMW ALPINA needs to be able to be very fast at all times, and not just under a restricted set of circumstances – which is also why Bovensiepen has always ensured that his cars are suitable for daily use, also with regards to their handling limits and ride comfort. Another factor that was always close to Bovensiepen’s heart is efficiency. This resulted in certain BMW ALPINAs boasting better fuel economy (sometimes just per bhp, sometimes in absolute terms) than their equivalent base cars. It also had the effect of putting little ALPINA at the forefront of modern diesel technology, which the company embraced as early as in 1999, with the BMW 5 series-based D10 Biturbo model. Mind you, all this fuel saving certainly doesn’t mean Bovensiepen, who openly describes himself as a ‘dyed-in-the-wool capitalist’, was prone to greenwashing, but rather that he strictly adhered to his set of values in this instance, as well. Despite his mischievous attitude, Bovensiepen is a man of values, be they taste and performance – or loyalty. He’s as willing to walk the tightrope of irony regarding a great many topics, as he’s remorseless when it comes to his company, its products and his employees. Both BMW ALPINAs and ALPINA’s employees, many of which have been with the company for decades, are no laughing matter to him, which is why the company’s factory in the small town of Buchloe in Bavaria feels every bit the family business where everybody knows everybody’s birthday. The fact that Bovensiepen lives in a traditional Bavarian house right in the middle of the factory’s premises only serves to stress the point. But when it comes to aesthetics, Burkard Bovensiepen’s mischievousness comes into play yet again. Once more, ALPINA is all about juxtaposition: the discreet appearance of a mass production vehicle, coupled with idiosyncratic details such as the Deko-Set or the traditional ALPINA wheel (which is a Bovensiepen design, by the way); the impeccable craftsmanship of ALPINA’s artisans and saddlers contrasting with the garish plaque that adorns every ALPINA’s dashboard. 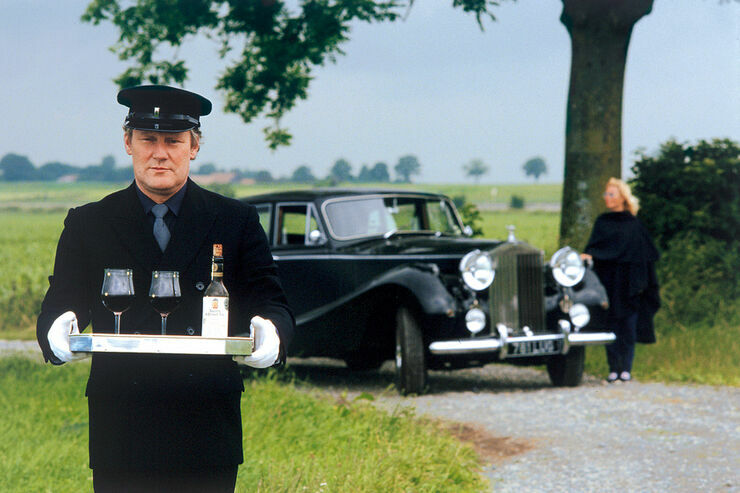 Despite being a proud Bavarian (albeit Saxony-born), there’s always a sense of cheekiness to the aesthetics of Burkard Bovensiepen that’s decidedly un-teutonic, but could be expected from a man who only ever drives his ’54 Hooper-bodied Rolls-Royce Silver Wraith wearing a chauffeur’s uniform. In today’s Nürburgring lap time obsessed automotive realm, ALPINA finds itself in the unique position of being supremely successful on the one hand, but a bit of an anachronism on the other. Of course, ALPINA doesn’t have to buy complete BMWs in order to de- and then reassemble them, with a great many components being exchanged for ALPINA-worthy parts, anymore. The days of in-house engine manufacturing are also gone (instead, ALPINA’s components are installed right at BMW’s factories). Yet this is still a business whose owner knows many of his repeat customers by name, a company that hasn’t sold itself to big business (despite overtures). Today, ALPINA may be selling SUVs like anybody else, but is wilfully restricting its tall offerings to an ALPINAFIED X3 variant, rather than selling hundreds of overweight, overpowered X6s to sheikhs and oligarchs. Burkard Bovensiepen may have left day-to-day operations to his sons, Andreas and Florian, but his influence is sill felt everywhere. Long may this brave little company – that has nothing to with aftermarket offerings whatsoever, by the way – continue with doing things the Bovensiepen way. Learning more about this company latterly – and I believe there’s a rather fine large format book on this subject now by the way – I appreciate Bovensiepen’s achievements more, something this fine piece has only added to. Regarding the Deko-Set, it’s interesting to note that its popularity varies greatly from market to market. It’s the least popular in the UK, whereas almost 100% of Alpinas sold in Japan are adorned with the characteristic stripes. When BMW introduced the E28-series M5 – (were the M-cars an ploy to capture some of the ALPINA market? ), I considered its low-key appearance to be one of its more compelling attributes. This was I suppose the antithesis of the be-Deko-ed ALPINA look. It’s interesting then, over the intervening years, to note how BMW and ALPINA have in effect crossed over. Today, Bovensiepen’s cars are the subtle ones, while BMW-M’s current steroidal offerings may as well have *tacky stripes and decals all over, such is the level of visual noise and self conscious posturing. [NB: *At least the Deko-set were artful and over time have become somewhat iconic]. Truth be told, I really rather like the Deko-Set on Bracq-era BMWs. Their trapezoidal shape complements these models’ ‘yacht’ shape in a graphically pleasing way. To me, that’s a nice ’70s interpretation of the good old coachline, but anyone is of course free to disagree with this assessment. Early M-cars were truly fast, brutish things. Although highly desirable in their own rights, those early M88-powered models were truly motorsports-like insofar as they placed performance over everyday reliability. Alpinas were more rounded, accessible vehicles. I’d have a hard time myself choosing one over the other. Today, I wouldn’t have to think for a minute though. An Alpina B4 is a car I’d genuinely like to own if I had to do some everyday driving, which definitely isn’t the case with the M4. O tempora, o mores! Hmmm. How are you defining the term “after market” that ALPINA and their factory installed parts fit? When I think of after market it doesn’t include tuning houses whose parts can be found on zero mileage cars at the dealership. For me the idea of after market is someone that has no connection with the manufacture, someone whose parts cannot be found on a new car. So Roush, with a tuned suspension that can be found on showroom floor Mustangs is a tuner, while TEIN, with a tuned suspension that can only be installed after you have brought your Mustang home from the dealer would be an after market tuner. At least that’s how it works in my head. Clearly these aren’t universally defined terms. Pedantic questions aside, thanks for the post. I have an e21 project that a few people have told me I should turn into an APLINA clone but I never knew much of anything about them beyond the name and iconic graphics. Alhough certain Alpina parts can be bought post-purchase, the company obviously isn’t ‘aftermarket’. Consider the inclusion under this theme a minor provocation. Dinger: thanks for making that distinction. Kris has played loose and quick with the definition. Does Alpina’s wine cellar have any sherry or madeira? Ah well, I guess I was provoked. Although now I am a touch disappointed as I was looking forward to what I imagined would be convoluted explanation for ALPINA as after market. Kris: there is one sherry there, the very fine “Scully” by Hidalgo at €40 per bottle. It’s not an oloroso or palo cortado but a fino. That’s an unusually high price for this type of sherry. The alcohol level is 20% when finos normally have 15% or sometimes 17%. That tells you everything about my connoisseurship when it comes to wines and spirits. Waitress! I’ll have another bottle of that lovely Blue Nun! Kris, I’ve learned a lot from your fine piece. God bless German eccentrics! Alpina is a wonderful company that rewards dedication. A B7 Turbo or B10 Biturbo are among the most desirable fast German cars I can think of, exactly because Bovensiepen always despised the method of simply squeezing more fuel into an engine’s combustion chambers in order to make it go quicker. Alpinas always looked like BMWs, but the attention to detail that went into their creation means they possess a distinct character of their own. Thanks for the ‘German/Bavarian/(Saxonian) Tony Crook’ quote – I’ll use it myself at the next available opportunity. Rumours have it that Alpina’s money is coming from the wine, not the cars. Many of Alpina’s cars are actually BMW developments like the E36 V8 which were handed down to Alpina because producing a car with its engine mounted from above did not fit BMW’s production processes. Alpinas are meant to be more cultivated and restrained than the overly sporty and often brash M versions. Alpinas also carry more individualisation than is possible at M nowadays. Alpina once started as a typical aftermarket tuner (and in the backyard of Mr. Bovensiepen’s parents’ factory producing ‘Alpina’ typewriters) . Double twin choke carburettor conversions, special exhaust systems and engine modifications were typical Alpina stuff during the Sixties. Alpinas always were road-biased and suitable for everyday use whereas products of e.g. Schnitzer (not the AC Schnitzer of today) were much more race-focused. Alpina was among the first tuners registered as fully fledged manufacturers of their own once the ‘tuning’ business took off in the Eighties. I remember a story in the German magazine ‘auto motor und sport’ from the Seventies. By invitation from the magazine many motoring prominents gathered at Hockenheim, bringing their cars with them. Amongst them were Hans Heyer and Hans-Joachim Stuck with their racing 2002s. They were let loose at the race course, where Hans Heyer complained about a moving obstacle in form of Mr. Bovensiepens Rolls-Royce circulating the course at slow speed. Alpina (wines & cars) have suffered exactly one year of losses, which was about a decade ago. Burkard Bovensiepen, despite all that savour vivre attitude, is a man who has the bottom line in mind. I obviously don’t have the books to prove it at hand, but I’m as certain as can be that Alpina Automobile is earning a healthy profit. The E36 V8 wasn’t ‘handed down’ by BMW, but a challenge set by Wolfgang Reitzle, which Alpina met. V12-equipped Z3 and Z8 prototypes fall into the same category, though in these cases, no production run ensued. You are, of course, perfectly right about the early days of Alpina, when Burkard Bovensiepen was offering upgraded carburettors et al for the BMW 02 series. It was the fact that his upgrades were of such quality that BMW maintained the factory guarantee even when these third party components were fitted that Alpina broke through.